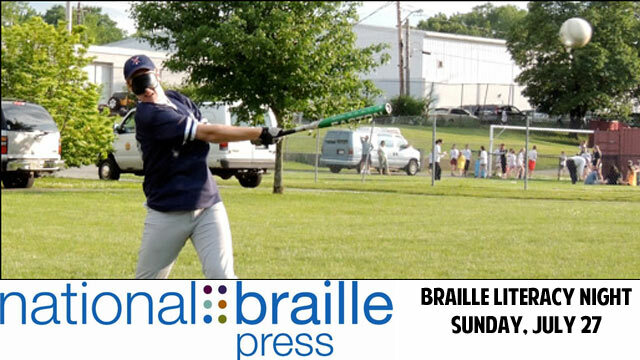 BOSTON, MASS.- Leading national braille publisher, National Braille Press (NBP) announced today that it will participate in Braille Literacy Night hosted by the Lowell Spinners on Sunday, July 27th. The evening will include awareness around the issue of braille literacy and its decline among the visually impaired community and will also feature an appearance from the famed beep ball team the Boston Renegades, a baseball team comprised of visually impaired athletes. The pre-game activities will take place before the Spinners take on the Brooklyn Cyclones at 5 p.m. at their home field at LeLacheur Park in Lowell, Mass. "We are thrilled to be partnering with the Lowell Spinners on this event which we hope will raise awareness around the growing trend in the decline of braille literacy for the blind and visually impaired," said Brian MacDonald, President of National Braille Press. "The fact that we are able to share this night with the Renegades, a group of truly remarkable and talented young men and women makes this even more special." National Braille Press will distribute complimentary braille alphabet cards to fans and attendees and also host a table where attendees can learn more about National Braille Press, braille literacy and the Boston Renegades. Prior to the game, the Boston Renegades will provide attendees with an exhibition of "Beep Ball", a form of baseball that includes a beeping ball and a buzzing base. The exhibition game will be played at 4pm along with other pre-game events including clips from the film The Renegades: A Beep Ball Story, which will air over the Spinner's jumbotron and the team's participation in the ceremonial throwing out of the first pitch. "On behalf of the Boston Renegades, we'd like to thank the Lowell Spinners for welcoming us onto their field," said Joe Quintanilla, 12 year member of the Boston Renegades and Director of Major Gifts and Planned Giving at National Braille Press. "It's not every day we get to play in front of hundreds of baseball fans and we are excited to have this opportunity to showcase Beep Ball to such a large audience." The Boston Renegades are a team of visually impaired athletes and volunteer coaches from the greater Boston area that compete in an adaptive form of baseball. This is a competitive team which is part of the NBBA and plays against opponents all over the country. The Boston Renegades are operated by the Association of Blind Citizens.